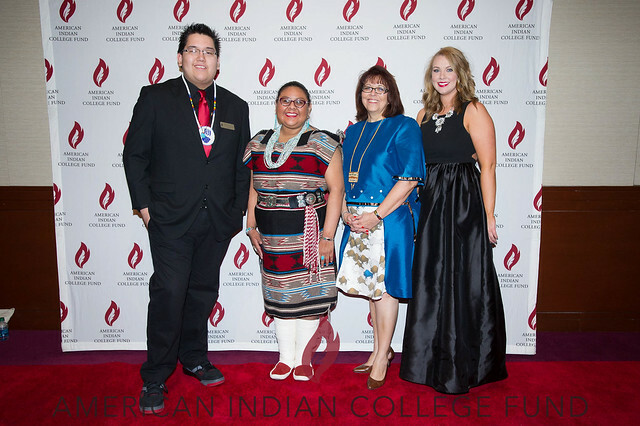 Cheryl Crazy Bull and the Native Scholars pose for a photo at the Flame of Hope Gala in New York City on March 1, 2016. Mitakuyepi, Wacinyanpi Win emaciyapi le na Sicangu Lakota ematanhan. Cante waste nape cuyuzapo. Friends and Relatives, my Lakota name is Wacinyanpi Win, which means “they depend on her.” I am a Sicangu Lakota from the Rosebud Reservation in South Dakota. I greet you with a handshake and a good heart. Student speaker Waycen at the Flame of Hope Gala in New York City on March 1, 2016. At the American Indian College Fund’s recent celebration of our work in New York City, we were able to share our students’ stories to give a brief glimpse into the lives of some of our scholars in their own words. At that event, I shared a few words about what hearing these inspiring stories can lead to and shared how you can take a stand that transforms the lives of Native students. When I hear the words of our students share their aspirations to be heard, to be recognized, and to be seen, I am reminded of his words. Because our students, indeed all of our Native people, should not have to get up and talk about what we are doing. The people of this country have eyes and they should be able to see us. We must be seen so that our gifts and our knowledge can contribute to a better society. But sadly that is not our reality—instead the reality is that Native students and Native people are invisible. We are left out of important discussions that can inform decisions and policies, we don’t get to share our cultural and scientific knowledge, or give the gift of our amazing languages, our art, and our music. Many times we are even invisible when we are standing right in front of others. Being invisible is painful. I know because I have spent most of life striving to be seen, as a woman and as an indigenous person. But stories like those we heard inspire me to continue striving to be seen and acknowledged for my upbringing and my vision. The creator gave me two gifts when I was a young woman. One was the gift of my Indian name from my grandmother–They Depend on Her. The second was the gift of the courage and the will to get an education and to follow the path to become an educator. Courage and education both gave me a voice. I had to stand up for my people and be someone they could depend on. Courage is an important part of standing up. And an education combined with that courage made my voice stronger. Courage is often an act in the moment. At our New York event, as now, the American Indian College Fund is giving our supporters, our students, our tribal college faculty and staff, and indeed everyone that supports American Indian education the opportunity to do something courageous–the opportunity to stand with our students. I want to recognize you. I want to tell that I see you and we have begun a movement that will help others see you. When the College Fund conducted the research that supports our work, we were not surprised to learn that most people are shocked to hear how few American Indians have college degrees. They were shocked to hear how few American Indians even get to go college. But we can take that shock and turn it into action. We have the will to overcome the fact that only 13% of American Indians hold a college degree by helping even more Native students go to college. We can build more scholarship resources and support from programs that help them stay in school so that they, too, can use their courage and education to have a voice. So I say to Native students everywhere, inajin, stand up, so we can see you. And I ask our supporters and those who wish to support Native education to pause, close your eyes, and imagine the hundreds of Native students who are in our colleges and universities, wanting to be seen. Alberta poses with a guest at the Flame of Hope Gala. And then I want you to do something that is very indigenous – I want you to think of the next seven generations of young people who are coming after the Native students who are in our world today. Imagine them, standing with these students, thousands of them, benefitting from our support. One of our students, Alberta, says that she is carrying on the dreams of her ancestors. You will be the ones whose dreams inspire the next seven generations. I want you to see all of those young people, earning an education, leading prosperous lives, becoming scientists, lawyers, entrepreneurs, computer programmers, doctors. See them curing diseases, creating businesses, discovering new knowledge, and through it all integrating and sharing their sacred indigenous knowledge. We are starting a movement. I invite everyone to stand up together, inajin, stand up, inajin, to stand with our students. We are going to use our movement, Stand With Native Students, to increase the number of American Indians and Alaska Natives who have college degrees. We are going to use the tools of modern society – technology – to help more people Stand with Our Native Students. Standing with our students will transform their lives. You can take action, an action that in one moment can be a pivotal point for a Native student. One of our goals is to provide financial support so more Native students can go to college. We intend for our Stand With Native Students movement to raise $500,000 in the next four months to help another 100 Native students get a college education. We invite all of you to join in support of our students going to college. We started a movement to #StandWithNativeStudents on Twitter. We need your help to use social media to tell the stories of our students, to help them be seen. You can go to our website created just for this movement to see student stories. You can also instantly donate online. Please share our web site with your friends and followers on Twitter, Facebook, LinkedIn, Instagram and your other social media sites so that even more people can see our students and hear their stories and stand with them. Invite others to share to start a movement to transform the lives of more Native students. Inajin, Stand Up, because standing up is an action. Actions are visible. And the actions you take – making a financial gift, sharing our stories, making a public commitment – transform lives. Wopila, mitakuyepi, thank you, my relatives. I appreciate your courage because that is what it takes to stand up for those who have been invisible.